Inside your teeth are sensitive nerves, pulp and blood vessels that work there to support and sustain each tooth. They are contained inside your tooth in tunnel shaped spaces that lead from just under the tooth surface down through to the tooth’s roots. These spaces are called ‘root canals’. When infection builds up inside the root canals of your teeth it breaks down and destroys those sensitive nerves, pulp, and blood vessels and can destroy your tooth. Your first indication of this damage may be pain from your dental nerves that are being destroyed by the infection. The tissues and nerves inside and surrounding your teeth become inflamed and vulnerable to worsening pain as the infection spreads throughout each tooth. Root Canal Therapy is performed by your dentist to remove the damaged or destroyed nerves and tissues inside your tooth. The top of your tooth is removed and the infection and destroyed parts of the tooth are cleared away, then the tooth is cleaned and disinfected and the root canal spaces are filled. Your teeth may also need crowns or other restorative processes, depending on the amount of damage that has occurred. Your dentist will talk with you about your individual needs and what options are available to you for this part of the root canal procedure. Inside your teeth are connective tissues that distribute nutrients throughout your tooth and help to keep it strong. When an infection invades the inside, the pulp and tissues are damaged. Without treatment, the infection can destroy the pulp and tissues and lead to the loss of your tooth. The nerves in your skin and the rest of your body signal your brain to environmental changes, pressure, injury, and good feeling sensations. In the same way, they work to send signals to your brain alerting you to changes in temperature and pressure on your teeth. And just as your brain can make adjustments to your body when they indicate a change is needed, your brain can interpret the signals from these nerves in your teeth and signal you to make an adjustment if needed. 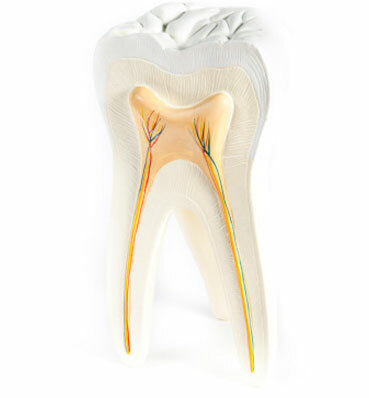 These nerves are very sensitive, and they are protected inside the tooth to prevent anything from touching them. But even the tiniest crack in the tooth can expose them to the air or the hot or cold food that you are about to eat. And these sensitive nerves respond quickly, sending a painful signal to your brain. Let’s take a look at your tooth and determine what your root canal needs are. Our highly advanced, cosmetic dentistry office located in beautiful Scottsdale, AZ offers you a relaxed setting with the ultimate in care and personalized attention, just for you!